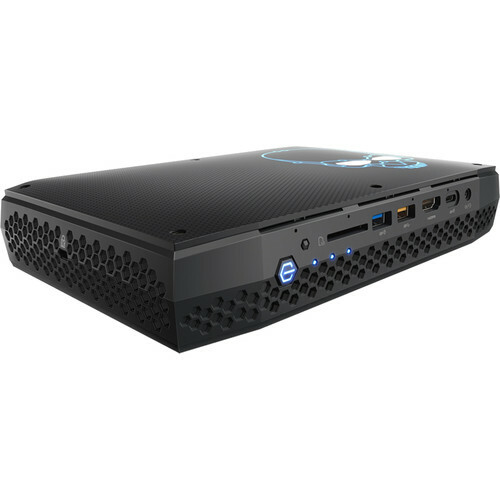 The NUC 8 VR NUC8I7HVK Gaming Mini PC from Intel is a compact, barebones system equipped with a 3.1 GHz Intel Core i7-8809G quad-core processor and AMD Radeon RX Vega M GH graphics. It has two DDR4 SO-DIMM slots, supporting up to 32GB of 2400 MHz RAM, and two M.2 slots for storage drives. Unlike other NUC systems, this system's dedicated AMD Radeon RX Vega graphics is powerful enough to run VR applications and play graphically demanding games. Moreover, there are six video ports that you can use to connect displays. Other integrated features include 802.11ac Wi-Fi, two Gigabit Ethernet ports, Bluetooth 4.2, an SDXC card reader, and multiple USB ports. Included with this system is a VESA bracket, which you can use for alternate mounting solutions. The Intel NUC is a barebones system and does not include RAM, storage, or an operating system. Please note that you will have to install these on your own for it to function. This system has a total of six video ports including: two HDMI, two mini-DisplayPort, and two Thunderbolt 3 ports. As the NUC was designed especially for home theaters, this system features a front panel infrared sensor, which allows wireless communication with infrared-compatible devices, such as remote controls, keyboards, and other devices. Box Dimensions (LxWxH) 10.8 x 7.7 x 4.8"
NUC 8 VR NUC8I7HVK Gaming Mini PC is rated 4.5 out of 5 by 11. Rated 5 out of 5 by Kevin H. from Compact, quiet but powerful. I've been running Steam VR and Mixed Reality games on this, and so far they've been running smoothly. Just be sure to download all the drivers from Intel's site. A lot of things won't run well without those installed. Added 32GB RAM, 118GB Intel Optane SSD, 512GB SSD. Rated 5 out of 5 by David from Awesome This thing is a very impressive and well packaged. I installed a Samsung 970EVO and some low latency RAM. Boots-up in like 5 seconds. Pros: Powerful, a solid desktop replacement. Quiet. Small, very small. Lights are neat, but yes, you can disable them. VESA mountable. Plenty of ports. The VEGA M GH is actually pretty powerful. TB3 port in case you decide to step up your gaming with an eGPU. Cons: The power supply is almost as big as the PC. You will need to go to Intel and install all the latest updates, i.e. the VEGA card isn't defaulted to run nor has drivers pre-installed. Their driver assistant software is the easiest way. It's barebones, so need a Hard Drive, memory, and OS. Rated 5 out of 5 by Stephan from Power House of a Mini PC I paired this with a Samsung 970 Pro 512gb that was on sale. As well as a G.Skill 32gb kit at 3000mhz that I also got "on sale" (as you know ram prices have sky rocketed). During the tear down and installing everything, the RGB skull never came on. The ribbon cable's plug doesn't sit in the housing very well, so you have to be careful when you put top casing back on. It is very loose. Maybe some heat resistant tape could help it not move around if it ever comes loose again. I had to remove the top to readjust it 3 times. I've set my base clock to 4.3Ghz and opened my ram up close to the 3000mhz speed in the bios. This does 4K. Using 3D direct or Vulkan just works. You may have slow down certainly in heavy processed games, but it's no problem if you tweak some lighting and fx, and 4k isn't an issue on older games for sure. If you want the best performance, you can run 1080p on ultra settings. I'm running a 4k 60hz TV off mini dp 1.2v via active HDMI converter that's hdcp 2.2 and HDMI 2.0, going through an A/V receiver. Using windows Dolby Atmos is a dream. I can't wait to download Battlefront 1 and try out the spatial audio that is Dolby Atmos. I tried out Dead Space using the codec and my 4k display, and just wow. The amount of IO on this motherboard is awesome. I'm also running a 34" ultra wide 2560x1080p @75hz monitor as my main display. I also own a 120hz 1280x720p 3D Head Mounted Display, (Avegant Glyph) that I use for 3D gaming. And using Dolby Access I was able to use Atmos for headphones for it as well!!! I'm able to run all of these displays all at the same time, all at their respective resolutions and refresh rates. It's pretty awesome. This thing is beast. You won't be playing in 4k in newer AAA titles coming out next year, but everything this year and some in early next you pretty much can without sacrificing some stuff. Cons.... Like everyone says..... It's too expensive. Getting an SDD, Ram, and Windows 10 pro is not cheap. Rated 5 out of 5 by Jarangoh from ?Espectacular! Funciona de maravilla. Es un excelente producto, muy poderoso a pesar de su peque?o tama?o. Tiene puertos para cualquier dispositivo externo. Rated 5 out of 5 by Chris from Supports dual boot Windows 10 & Linux Ubuntu 18.4 I use my Hades Canyon as my main computer, including running Photoshop on it as an amateur photographer (think, Flickr). It handles most Photoshop and Light Room basic to moderate+ editing fine. Recently, I partitioned one of its two, 500GB NVMD PCIe drive, then installed Ubuntu 18.4 on it. It runs fine. I have it set up to dual boot from BIOS at startup. Apparently it runs Ubuntu now because some NUC retailers worked with Ubuntu Canonical folks to help write drivers for the AMD/Intel integrated graphics. It easily supports my 4K dell monitor at full resolution (3840 x 2160). With two M.2 slots sporting fast drives, the machine sails along. No real complaints. No major annoyances and certainly no show stoppers. The many I/O ports enable straightforward connections. Sure, you can build or buy a machine with this ones core capabilities for a bit less, but size and design are incredible and elegant. Rated 5 out of 5 by Dylan from Fast, compact. Love it. You pay more for the form factor than you would for similar performance in a tower, but if you need to be mobile with multiple monitors, this is a must. Rated 4 out of 5 by Tomonori from good for Casual use and Live PA The GPU was not as fast as I was supposed. However,it is fast enough for casual use, live PA and recording. Rated 5 out of 5 by Scott from Wicked Fast in such a small form This little box is wicked Fast in such a small form factor. It was also super easy to add RAM, SSD, and OS. Does Intel ever sell this in a white case? The Intel NUC 8 VR NUC8I7HVK Gaming Mini PC B&amp;H # INBNUC8HVK1 is only available in black at this time. Does this support 2133 Mhz SO-DIMM ? Can i install Ubuntu 16/18 version without any issues? I'm using Arch Linux on this device. I'm not sure whether Ubuntu 16 will work, but it seems Ubuntu 18 is working fine on this device. For using the AMD graphics on this NUC, you need at least Linux 4.18 kernel, and very new firmware. If you don't need AMD GPU, just switch it off in BIOS and most Linux distros will work fine on this device, I believe. How loud is the cooling at full load? Playing hours of Overwatch and Star Citizen with little noticeable sounds from the fan. Will using DDR4 DRAM faster than 2400 make this NUC operate faster? This NUC says it's compatible with DRAM faster than 2400 but that doesn't necessarily mean that faster DRAM will actually make the NUC faster. Faster memory will get you some performance gains, but the amount may be negligible. Don't expect to get a 25% performance boost if you go with DDR4-3200 over DDR4-3200. That said, if you're trying to figure out where to best spend your money for components, I'd look at the SSD before anything else.